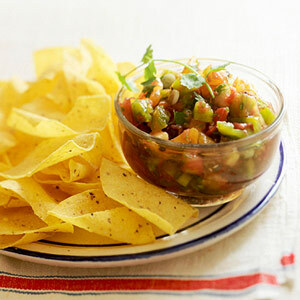 Fresh cilantro, garlic, and chile peppers give this salsa its great flavor. Serve it as an appetizer with tortilla chips or use to top tacos or burritos. In a food processor, combine chile pieces and garlic. Cover; process with on/off turns until finely chopped, stopping and scraping down sides as needed. Cut 1 of the tomatoes into quarters. Add tomato quarters and cilantro to food processor. Pulse 4 to 6 times or until you have a coarse puree. Transfer tomato mixture to a medium bowl. Cut remaining tomato into 1/4-inch pieces. Add tomato, green onion and lime juice to the bowl. Season to taste with salt, usually 1/4 to 1/2 teaspoon. (Note: This salsa is best if eaten within an hour or two, but it will keep for a number of hours in the refrigerator.) Makes about 2 cups.